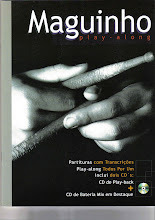 Primeira música em compasso 5/4 do Cd instrumental do baterista Maguinho Alcantara Brecht e do baixista Eduardo Kusdra. Executado apenas por baixo e bateria, o Cd com lançamento previsto para o primeiro trimestre de 2012, apresenta 8 músicas em ritmos brasileiros (Maracatú, Baião, Frevo e etc...) e em outros ritmos com forte infuência do Funk, Fusion e da Soul Music. Maguinho é endorser das marcas Pearl Drums, Zildjian, Luen Percussion e Vic Firth. Eduardo é endorser da Mayones Guitars & Basses. /// First song in a 5/4 time signature of the instrumental Cd of drummer Maguinho Alcantara Brecht and bassist Eduardo Kusdra. Played only with bass and acoustic drums, the songs in this Cd covers many brazilian rhythms such as Maracatú, Baião and Frevo, as well as songs with a strong influence of Funk, Fusion and Soul Music. The Cd will be released at the beginning of 2012. Maguinho is endorser of Pearl Drums, Zildjian, Luen Percussion and Vic Firth. Eduardo is endorser of Mayones Guitars & Basses.